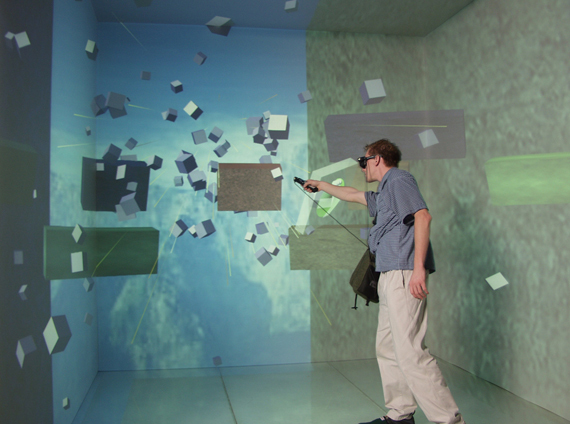 Whether you want an inflatable dome made by Elumenati or a CAVE from Christie, VR-MAX can provide you the hardware, software and virtual reality content. Turnkey production, whether shown with Goggles, Domes or in a CAVE, makes the impossible possible. 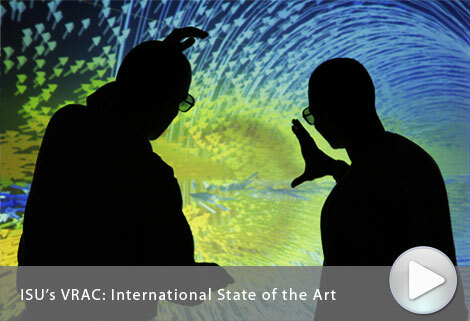 Further, Dome enabled virtual reality frees researchers from headsets, goggles and tiny screens, and allows them to interact with their inventions and concepts in real time. This allows for thorough concentration in a manner not possible on a small, flat screen, or without the encumbrance and fatigue of a Head Mounted Display. A state-of-the-art Elumenati Inflatable Planetarium has high-end theatrical resolution, and pixel-perfect, undistorted imagery projected in a half-sphere, approximately 180 x 180 degrees. The Theater is a fully enclosed dome with a 25′ diameter and a height of 13′. Setup takes 15 minutes, and its open doorway is uniquely accessible. The TrojanDome is a custom-designed Elumenati Theater. The Portal, a truncated dome 13′ wide and 9′ high, can be oriented vertically, for audiences facing forward, or horizontally, for overhead viewing. Portals of varying sizes has been used by Ecolab, USG, and Pfizer to name a few. It is available for rent. Designed to fit in rooms with an 8′ ceiling, the Panorama is the perfect environment for flight, driving, and training simulations that require wrap-around views. 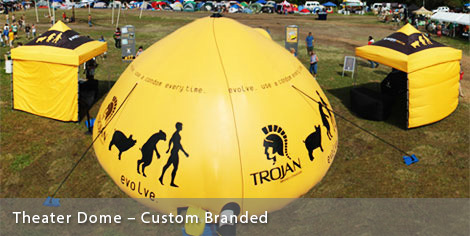 Need an individual dome? Nothing on the market is better than the Cobra. 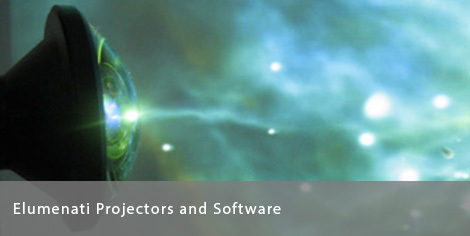 The system includes a 1.5m seamless screen, a 3,200 lumens 1920×1080 projector, and custom features. 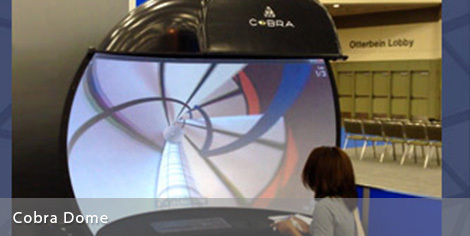 Please note the Cobra is not considered a portable system – it is better suited for tabletop or kiosk display. 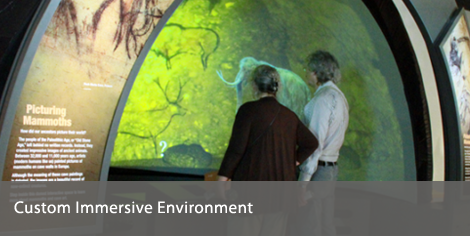 The Custom Immersive Installation pictured on the left is in the Field Museum, Chicago. It features a custom facade and a Slurpee®-resistant projection case. Our largest installation (not pictured) houses 100+ people at a time in a 360-degree, semi-portable fabric-screened panorama, 42 ft in diameter and 16 ft high. By using four OmniFocus 600 series projection systems – two per screen – we achieved 4k resolution, with active stereo content. 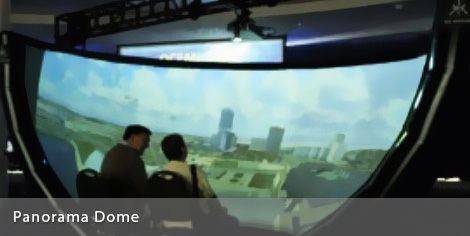 Capitalizing on the unique features of OmniFocus projection systems, guests could stand as close as 4 ft to the screens without casting shadows, all from a single PC. VR-MAX represents the entire Elumenati product line, which includes the world’s most advanced, accurate patented lens and warping software. Contact VR-MAX for your new corporate theater, content and service. A full-scale state-of-the-art C.A.V.E. is different from a planetarium dome in that it is a 6-sided room, with projections on all surfaces, and has resolution at the limit of human capability to perceive. Generally speaking, a CAVE is used for high-end R&D, not marketing. Which is exactly why we’d like to use one for marketing!